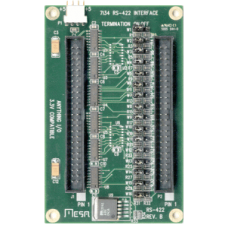 The 7I34 is a 8 channel RS-422 interface for Mesa's Anything I/O series of FPGA interface cards. The 7I34 has 8 independent receive and transmit channels. Each transmit channel has a independent drive enable for bus or 2 wire half duplex systems. The controller connection is a 50 pin header that matches the pinout or the 4I34M, 4I38, 4I65, 4I68, 5I20, 5I22, 5I23, 7I43 and 7I60 Anything I/O cards. Another 50 pin header is used for RS-422 connections. The 7I34 has an assembly option for receive only applications. This model (7I34-R) has 16 RS-422 inputs but no outputs. Another assembly option (7I34-485) replaces the drivers with RS-485 compatible chips. The 7I34 can be used with an Anything I/O card for multiple channel RS-422 serial interfaces, encoder interfaces, and many other industrial applications.